Kids Watch - Black Ultra Thin Silicone Watch Strap Provides Comfortable Wearing Experience. Digital Watch - Equit with Japanese battery ,imported LED light and highly silicone straps. 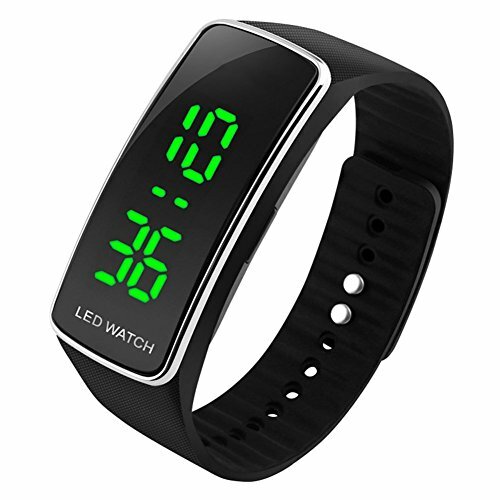 Mutifunction Watch - Come with delicate Led display clear screen ensures Easily Reading Time and Date; single setting button; hour/month/day display; 30M water resistant. Watch Suits - Unisex Sports Silicone Bracelet Wrist Watch, Suitable for Girls and Boys. Package included : Silicone Bracelet Wrist Watch*1, Manual Instruction *1.